The new 5.0-liter Mustangs can be fitted with either the 6R80 six-speed automatic transmission or the MT82 six-speed manual. Ford Motor Co. today said the 2011 5.0-liter V8 Mustang GT will deliver 412 hp and 390 lb-ft of torque. The engine produces 83 hp per liter yet will return 25 mpg on the highway and 17 mpg in the city, according to Ford marketing boss Jim Farley. The 5.0-liter Mustang's main competitors are the Chevrolet Camaro SS, rated at 426 hp, and the Dodge Challenger SRT8, which makes 425 hp. The top-of-the-line Shelby GT500 and its supercharged V8 remains the pony car horsepower king, rated at 540 hp. Ford engineers designed the engine to breathe. All-new heads sit atop an all-new aluminum block with cast-iron cylinder sleeves. The wide distance between the heads allows for the intake ports to sit vertically on top of the engine. The engine features four valves per cylinder and twin independent variable valve timing. Peak horsepower is reached at 6,500 rpm. Redline is 7,000 rpm. Use of aluminum and composite materials in the engine lowered the V8's mass to just 430 lbs, some 20 percent lighter than the previous 5.0-liter engine. The engine produces 83 hp per liter yet will return 25 mpg on the highway and 17 mpg in the city. In addition, the Mustang GT is fitted with electric power assist steering and 11.5-inch front and 11.8-inch rear vented disc brakes. Available as an option is a Brembo brake package with 14-inch front rotors and the accompanying bigger calipers from the Shelby GT500 and unique 19-inch wheels fitted with summer tires. The Mustang GT has new 5.0 fender badges and is available in three new colors: Yellow Blaze Tri-Coat, Race Red and Ingot Silver. The pony car will make its official debut at the Detroit auto show in January. • The new Mustang GT continues Ford's powertrain offensive with an all-new 5.0-liter V-8, which uses advanced technology to deliver 412 horsepower and projected unsurpassed highway mileage of 25 mpg. The 5.0 is back! The 2011 Ford Mustang GT arrives with an all-new advanced 5.0-liter V-8 engine, developed by a passionate cadre of engineers who rallied around the common goal of delivering more than 400 horsepower. "This all-new 5.0-liter engine is the next chapter in the development of the world-class Mustang powertrain portfolio," said Derrick Kuzak, group vice president, Global Product Development. "It's a thoroughly modern engine for the times, delivering the performance and fun-to-drive factor that enthusiasts want, while improving fuel economy." A critical element in the 5.0-liter V-8's ability to deliver 412 horsepower, with improved drivability, tractability and fuel economy over the 2010 Mustang GT powertrain, is enhanced Ti-VCT. For a high-performance application, the team specified cam-torque-actuated variable camshaft timing. Increased volumetric and thermal efficiency from Ti-VCT gives faster response across a broad range of engine speeds. The six-speed automatic transmission on the 2011 Mustang GT will deliver up to an estimated 25 mpg highway and 17 in the city. This is up from 23 mpg highway and 17 city for the 2010 model. Mustang GT models with the six-speed manual are projected to deliver 24 mpg highway and 16 city, matching the 2010 model but delivering significantly more horsepower and performance feel. EPAS has made a dramatic contribution to Mustang GT driving dynamics, delivering quicker on-center steering response, increased effort at highway speeds and reduced effort required in low-speed parking maneuvers. EPAS allows specific tuning for the Mustang GT application. For 2011, front and rear brakes are larger, the rear lower control arm has been improved and rear stabilizer bar bushings have been stiffened. 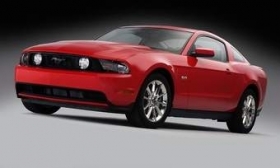 The 2011 Mustang GT also benefits from improved noise, vibration and harshness control. "This new powertrain honors Mustang's heritage by raising the bar on performance while increasing fuel economy," said Barb Samardzich, vice president, Powertrain Development. "For enthusiasts, such as the passionate members of the 5.0-liter V-8 team, it's like having your cake and eating it, too."